Lets talk about how to remove powder coat. Why would you want to strip powder coat from a part? As you start powder coating, you are going to make some errors. It doesn't always come out like you expected. If that happens, it is nice to be able to remove the powder coating so you can try again. There are several ways to remove powder coat. You an remove powder coating with a chemical stripper, media blasting, or a burn-off oven. By far the easiest way to strip powder coat is chemically, and Benco B17 is by far the best powder coat stripper. B17 will remove most powder coatings in less than 20 minutes. It is also great at removing paint and just about any other coating. It has a high concentration of methylene chloride which is what removes powder coat. To use the stripper, you simply dip the part in and wait. Check on it every 5 to 10 minutes and pull it out when you see the powder coating is falling off. From there you can rinse the part in water mixed with TSP (tri-sodium phosphate). TSP will neutralize all of the B17 chemical, but you also need another TSP dipping tank if you go that route. The water/TSP will rinse off and neutralize most of the B17 stripper, but to ensure that you have removed all of the stripper, a quick bake in the oven will evaporate any traces left over. Once the part is completely dried, it won't be pretty. 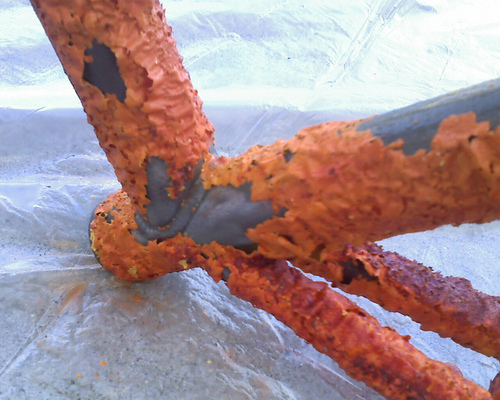 The part will develop surface rust after the stripping process but this is easily removed by media blasting (to learn more about media blasting, check out the Media Blasting article). For longer or awkward parts that won't fit in a powder coat stripping container, a rag soaked in B17 can be used to wrap around sections of the part. Keep the rag stored in an airtight container when not in use and you can reuse it. All safety gear mentioned below must be used while handling the B17. 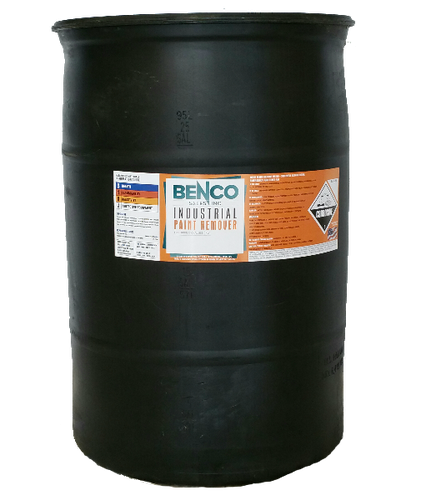 Benco B17 can be ordered from MIT Powder Coatings in 1 quart, 5 gallon, and 55 gallon quantities. It slows down in cold weather (you must heat up part before submerging in colder areas). It works faster and lasts longer than just about any powder coat stripper on the market. See video below. 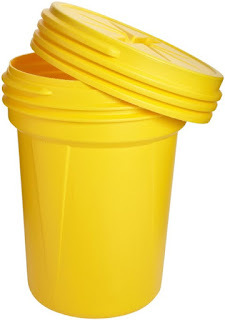 B17 and other powder coating strippers must be stored in an HDPE container with a lid. I suggest a container that is as big as your oven (if you are using a household oven or smaller). Since you cannot powder coat things larger than your oven, there is no reason to have a stripping tank larger than your oven. If you do have a large oven, I suggest a stripping tank that accommodates your biggest, most-frequently coated item. Example: If you often coat 22" rims, make sure you get a drum that is at least 23"+ in diameter. If you are powder coating motorcycle frames, get a tank that can fit at least have the frame in at a time. For the people powder coating smaller items, most of the time you can get away with the container that the B17 comes in. If you need to strip something that will not fit inside of the stripping container, you can soak some rags in B17, and lay them or wrap them around the part. This will work, it is just more labor intensive and takes longer. These Eagle Overpack Drums are perfect for B17 use and are the same tanks a lot of professional powder coating shops use. They have a sealing lid which you is highly desirable. It will contain the smell and will stop the evaporation of the chemical. They are a little pricey, but you only have to buy it once and they are the absolute best way to store a dangerous chemical like B17. 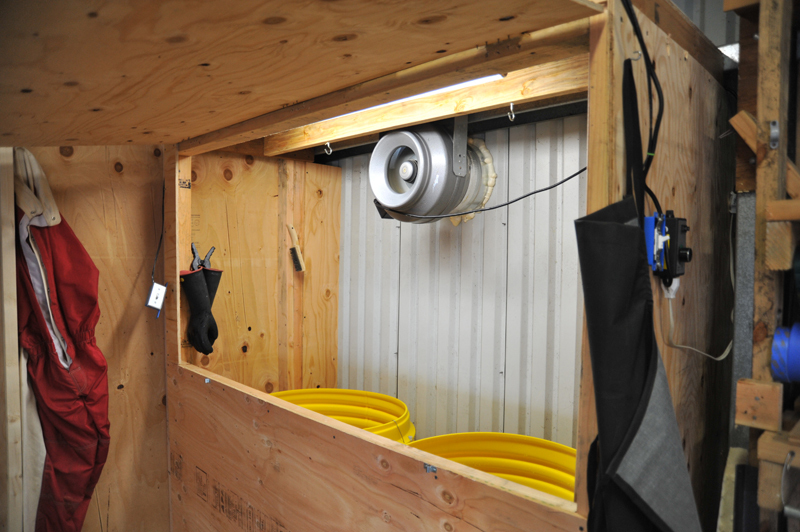 Here you can see a very professional powder coat stripping area using 2 95-gallon Eagle Overpack Drum, one for the B17 stripper and one is used as a rinsing tank. Also take note of the safety equipment such as the ventilation fan, chemical gloves, and chemical apron. This is a good idea of the safety precautions that need to be taken when dealing with B17 in a shop. These drums come in a couple different sizes so you will need to decide which one is right for you. Keep in mind the inside dimensions of your average home oven are about: 23" wide x 19" deep x 15" tall. The 20 gallon drum matches a household oven almost perfectly. It has a diameter of 21" and is 21" tall. This is a great powder coat stripping drum for the home powder coater doing small parts. The 65 gallon drum is perfect for wheels. It has a 31" diameter so it can all types of wheels and because it is 33" tall, it can fit at least 2 wheels at a time. The 95 Gallon Drum is for the serious powder coater. This drum will fit 4 wheels at one time which is sure to up your efficiency. 31" diameter x 41" tall. Chains can be used to lower and raise large parts into the drum. 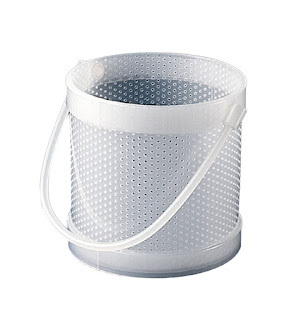 For smaller parts, a dipping basket can be used. 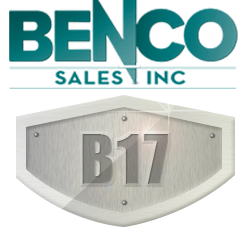 Benco B17 is a very effective but very dangerous powder coat stripper. It can burn your skin on contact. Do not go near this chemical without gloves and eye protection. I recommend the following. If you use the B17, remember to be careful. It is a serious stripper. Avoid actions that it will cause it to splash or spill. If you have small kids or animals that go in your work space, I don't recommend it. Be sure to read all of the safety warnings on the Benco website. Benco B17 is not the only powder coat stripper on the market. There are others that work well, not as well as B17, but the trade-off is that they are more pleasant to use. Powder Strip PS-1L is another powder coat stripper that I have used with good results. It is not quite as fast as Benco B17 and sometimes there will be some stubborn powder coat stuck in a crevice that does not get removed, but the smell is much better and it does not burn skin immediately on contact. PS-1L is by no-means safe to handle carelessly, but if you do ever happen to slip up and get drop of it on your skin, you will have time to get to a sink and wash it off before it burns and leaves scars. I can be around it with just a respirator and not smell a thing. There are several strippers of different strength strippers from Powder Strip and you can request some samples to choose which one you want to use. 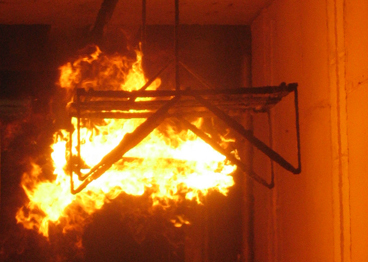 Keep in mind that the stronger stripper, PS-2L, will burn skin on contact. The average price for Powder Strip is $160 for a 5 gallon drum, $430 for a 30 gallon drum, or $640 for a 55 gallon drum. While Benco B17 is commonly referred to as the best powder coating stripper, it is really meant for a powder coater that will use it frequently. If you powder coat a couple of times a year and need a every-once-in-awhile powder coat stripper, a more common paint stripper can be used. These come in aerosol which are basically a one-time use can, or gels which can be lathered on. These aren't extremely effective at removing powder coat, but with enough time and multiple applications, they can work. One important consideration: unless the product contains methylene chloride, it will barely make a dent in the powder coat. It is best to wrap a part in saran wrap or a garbage bag after the product is applied as it will slow down evaporation. After waiting 30 minutes, unwrap the part and scrape off as much powder coat as you can. Repeat this process until all of the powder coat is removed. 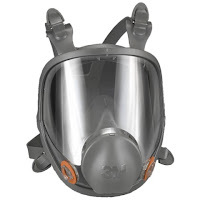 Chemical safe gloves, safety googles, and a respirator are also needed when using these products. Another method to strip powder coat is media blasting, more commonly known as sandblasting. This will take a very long time even for smaller parts. It takes about 30 seconds per square inch to strip powder coating this way. If you have a sandblasting cabinet and don't want to invest in the B17, then this method is basically the only other way. You can see how long it takes me to blast off very small areas in the video below. The first part is powder coated, ignore the second part as it is just spray paint. The burn-off oven method of stripping powder coat is not really for the DIY'er or small shop at all. It involves an oven that can heat parts up to 1000 degrees F to actually burn the powder coating off. I don't recommend this because at those temperatures, you are affecting the heat treating of steel and annealing aluminum. Also the ovens are very specialized, not something you can do with your home oven. Well written article about Stripping Powder Coating. I would like to offer Powder Coaters, Custom Coaters and the occasional "Do it your selfers" an alternative to using hazardous "Methylene Chloride" containing chemical strippers. 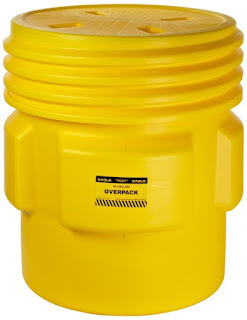 We at www.MilesChemicalSolutions.com have spent over 16 years developing and formulating non-methylene chloride chemical stripping solutions and have come up with a real winner, we call REMOVE 9000 Powder Coat Dissolver. -Raw material chemical cost to formulate eco-friendly chemical strippers is high, which correlates to expensive cost per gallon to the end user, however in our case, customers have communicated to us that our REMOVE 9000 Powder Coat Dissolver performance is worth the expense. -It is common knowledge in the Chemical Sciences that all chemicals slow down with cold lower temperatures and ours is no exception. Neutralizing acids... A cheap and easily available alternative for the amateur is (after initial rinse) to mix up a solution of baking soda and water, about 8:1 as a dipping solution. Or about 2:1 as a brush on paste. then rinse or power wash. Neutralizing bases ... Of course if you are using an alkaline stripper, mild acids such as vinegar or cheap lemon juices can help neutralize. You can buy little strip books of litmus paper to check when your dipping solution is losing its desired ph value (acid/alkaline properties). Hi, do you know if Benco B17 is suitable for stripping an aluminium bicycle frame (more specifically 6082 T6 alloy)? The chemical will not affect the structure of the aluminium? Being an expensive downhill racing frame this is fairly important! Benco B17 is very commonly used to strip aluminum and as long as you don't leave it submerged for hours, it should do no damage. The active ingredient in B17 is methylene chloride which is safe on Aluminum. However, some have said that B17 has damaged aluminum after leaving a part submerged overnight. I think this has to do with the aluminum containing other metals such as magnesium and that is what is being eaten. In the case of 6082, it can have up to 1.2% magnesium so just make sure you do not leave it in the stripper for over an hour. I have stripped lots of aluminum parts in it and have never damaged anything, but I only leave my parts in long enough to remove the powder, usually 10-30 minutes. I never leave them in the B17 unattended. Thanks for the useful reply. Your welcome. Thanks for reading. If you don't want ton take it apart, you won't be able to powder coat it. Painting is fine, but baking the engine at 400 Degrees F while assembled is a very bad idea. Also do not submerge the engine into any strippers. You can brush on the B17 but keep in mind it is dangerous to handle and can burn your skin on contact. Seal off any open ports, very well. You don't want any junk getting inside of the engine. Take off as much of the powder as you can with wire wheels, this will be a very LONG process. Use aerosol paint stripper to spray in the hard to reach areas. Wrap it in plastic wrap to keep the paint stripper from evaporating too quickly. Remove plastic wrap and scrape off the powder with anything you can get to fit into the tight areas, like a flat-head screw driver. Repeat this process untill all of the powder is removed. Then thoroughly wash the engine, make sure not to get any water inside of the engine. Prep for paint, I would use an 2 part epoxy primer before a 2 part paint for longest durability. Thank you for sharing your story, I really tried to stress the safety gear in the article, but nothing stresses it more than a story like this. I hope you are all healed up. Express Chem manufacturers a powder coating stripper as well that works great. It contains methylene chloride but no acids that are found in Benco. It has a lower odor and will not burn immediately on skin contact. It works great on aluminum wheels and bicycle frames. It isn't quite as fast as Benco but can usually be found for a much lower price. If your looking for a safer Methylene Chloride based stripper give them a try. Email bbeath@expresschem.com for a free gallon sample or check out their website at http://hydro-vator.com/. I have been following your guide for years. I started with a Eastwood in my garage now I have a Spectracoat ES-01 and a business with my wife. I'm thinking about upgrading from the Spectracoat. Have any suggestions? Your is guide dead on with every tip as I have tried and been thru every situation. I want to start chemically stripping rims. I usually have them blasted by a guy with an industrial blaster which is nice but is a hassle because I have to take them and pick them up. I have always steered clear of chemicals for fear of destroying a customer's part but sometimes time is an issue and you need parts particularly rims stripped fast. As you have said in many previous articles factory powder coating is the most stubborn to strip. You've said B17 is by far the fastest but is very dangerous. Have you ever used the Remove 9000 that miles chemical solutions is talking about is your post? They say it is Eco-friendly, has low odor and will not burn the skin on first contact. I'm looking to invest in a stripping setup soon so I want to know what's best. Thanks for a your guides over the years as they have taught me everything from the start. did you get a reply to your question chris as im after the same answer ? That is great that you have started a powder coating business. Congratulations on your success so far. Unfortunately, the only way to really step up from a Spectracoat gun is to get a professional gun such as Gema Optiflex, Nordson, or Wagner, but expect to pay $4000 to $5000. For a business, they really are worth it though. I have not used the Remove 9000 and currently only have experience with Benco B17. The only occasion I have ever heard of it damaging a part is when someone left a wheel in it and left his shop. He planned on being gone for 30 minutes but forgot he put the wheel in the stripper. When he came back the next day, the wheel was badly pitted and ruined. As long as you don't do anything like that, you should have no issues. I'm very happy that my guide has helped you over the years. Thanks for reading. Chris, I have used the remove 9000 here in my bike shop. I have only a 5 gallon pail of it. The stuff friggin' rocks! no burn, light smell. I know miles sells it in barrels too. My shop is HD oriented. So far I have only stripped gloss black swing arms and textured finished engine parts. Not sure about other colors or make ups of powder coating as I do not know much about the stuff. Suffice to say, when using the 9000, if you want to dunk and walk away, go right ahead. It doesn't attack metal in any way. Sam Miles said I can rinse w/water, which I do. The metal looks like the day it was knew before any coating applied. I make my welding repairs (if needed) and have the parts recoated when done. this stuff is the best, pricey no doubt but well worth it. I've had mine lil' 5 gallons now for 2 years. Just wondering if you know if this would be a good method to remove/strip a PVD chrome finish from a wheel? After sandblasted, what should we do before spraying application? After sandblasting, only handle the part with clean gloves. Blow the part off with compressed air. I also scrub the part with a stiff bristle brush while blowing it off. Then I do any necessary masking, then powder coat it. I have never had issues following this procedure. However, some blow it off with compressed air, then spray the part down with denatured alcohol, then blow it off with compressed air again. Then let the part dry fully, either air dry or stick the part in oven. Just be aware, that occasionally, there are some issues from doing this method, such as seeing water spots through the powder coating. Some people swear by it though. After Steps 1 & 2 (Disassembly & Cleaning), do you recommend stripping with a stripper versus a blaster because of its time saving attributes or for potentially better results? I have read so many things about stripping and blasting (with this site being the best/most detailed & clear) my head is spinning. I have a large amount of bicycles that I'm restoring (stripping & powder coating), some are steel and some aluminum. I've used strippers in the past but moving forward my preference would be to not use them for all the downside reasons listed in the article, Stripping Powder Coat. My goal is quality and because I have several bikes, I'm trying to nail down an efficient and results based process. That said, I guess my question(s) would be, does blasting the original paint (instead of using stripper) still need to be followed by outgassing and then blasted again? Or can I blast then outgas and then thoroughly clean? I'm sorry for the delayed reply. I missed this comment. Stripping is a very fast and efficient way or removing all coatings which also does a pretty good job of cleaning the item. Blasting takes significantly longer unless you have a serious compressor and media blasting setup. However, if you must do without stripper, it is possible to get by with blasting alone. It just gets frustrating when you get a defect when powder coating. Blasting off powder coat takes a very long time so it is highly beneficial to have a powder coat stripper available in those situations. As far as blasting, outgassing, and re-blasting, this would only need to be done if the item is cast aluminum, cast iron, etc. or if it has spent a long time in a dirty/greasy environment. If you only blast once, make sure that you do it AFTER you outgas the part. Sandblasting should be the last step before powder coating. However, you will have to call for pricing. Will the B17 or Aircraft stripper harm plated material? Zinc, yellow, or nickel? B17 and any powder coating stripper that contains Methylene Chloride is going to be on the acidic side and acids are are used to remove zinc and nickel plating. With that being said, I have stripped zinc plated parts with B17 before and visibly the zinc plating does not appear affected. However, I'm sure that it's life is somewhat reduced. As you say, B17 is an all around nasty chemical. But are you sure that it works faster and lasts longer than any powder coat stripper on the market? Have you checked out Greensolv? Here they do a comparison with B17 (methylene chloride)http://www.greensolv.com/Applications/Wheel-Refinishing . I definitely can't claim that I have tried every powder coat stripper out there but out of the ones I have tried, B17 seems to be the best. I have not tried Greensolv yet but I wouldn't mind giving it a try. no posts on this in awhile but I just came across this while looking at some other stripping solutions. I started off just stripping using Greensolv, the material was truckd in from Canada, Montreal I believe. We have two large heated tanks that are about 1000 gal each. We strip wheels and have baskets made up to lower into the tanks with a job crane. This stuff works great initially heated up to about 180F. It takes about 2 hours to strip most coatings from wheels. However, we routinely strip the chrome plating alternative know as PVD which does not strip easily. It took an overnight strip, typically 12 hours or so to get most of the PVD coating off. We would either restrip and fallout again or eventually start placing the stubborn one in B-17. We used a drum to manually drip wheels in one at a time to both meet the OSHA spec in rlation to air quality in methylene chloride applications and to minimize safety incidents. The effectiveness of the Greensolv rapidly went down with our increased stripping volume as expected. The cost was rather high combined with shipping to replenish the tank. We then made a decision to go with General Chemical's WheelStrip 4028 which is a very similar product to the greensolv. Basically the same thing but with much strong smell, you could not easily walk in the room without a respirator any time the tanks were opened. There was a large amount of the solids that were suspended in the liquid that you have to monitor and decide when to change the bath completely which is not cheap. It is a dissolver so it also generate quite a bit of sludge at the bottom of the tanks that must be cleaned out frequently. We didn't have any inline filtration but that would have been the best option. Continuing down the path of increasing thru-put and improving safety we just recently switched to another product from General Chemical - Stripoxy. It is water based, has almost no smell but it not nearly as stong as any of the others we have tried. Currently investigating a switch to using the B-17 in larger volumes as it really does a fantastic job. As mentioned above, this is not for amateurs. It is extremely dangerous and very easy to get burned. I have seen people just get a few drops from rinsing the wheels off. OSHA also requires air quality testing to be completed once per year as there are standards for allowable air quality. We have had to add upgraded exhausts and poke-yokes to minimize injury potential. The b-17 can also be disposed of as non hazardous waste for about $1 per gallon which is way cheaper than anything above. This is in line with my findings as well. There are several alternatives to B17 that are much less hazardous to work around but they are all lacking in effectiveness. The best option really depends on what type of powder coat operation it is. For any serious shop that does a lot of coating, B17 is likely the best choice because it removes powder very quickly and doesn't leave anything left behind on the metal. The safer strippers work great in DIY powder coating or home-shop operations where the user doesn't mind waiting longer for the stipper to work. Thanks for posting your experience. Just make sure you and your employees are trained in the safe use of B17 to minimize accidents. I had some parts that came out with bad spots in powder... Is it necessary to media blast parts again after using the b17 to strip? Yes, B17 will cause rusting and corrosion on parts that must be removed before coating again. If you have already media blasted the part, the second time blasting will go much faster. 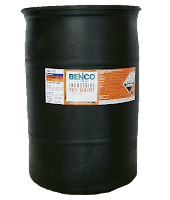 we use mild steel jigs at around 1.5meters in length and currently use a blast furnace to strip the cured powder every couple of days.. would you suggest benco b17 would be suitable as an alternative? Yes B17 strips powder coat very well so it will work for you. Make sure to adhere to all the safety guidelines if you decide to use it. thanks, and maybe you could answer as to how often the b17 would need to be replaced? It will depend on how often you are using it. It can continue to work for years as long as you maintain it. The stripped powder coat will remain in the liquid after stripping a part and once you have a buildup of that, it will become diluted and lose its effectiveness. It can be strained out however. The only thing that really gives it an expiration date is that it will slowly evaporate over time. I had a frame powder coated for an old Triumph I want to restore. The guy powder coated over the serial number. I need to remove the powder coating off of that 1/4 " to 1 inch long strip. Any suggestions would be great! Sean, I am a DIYer. That being said, why cant one take and use some of the very fine grinding/sanding dics? Is it because of the surface will have swirl marks? As far as the stripper goes...have you ever used any of the "Jasco Paint & Epoxy Remover"? Can be picked up a your local HomeDepot. Phil, that is a possibility. If you go to my article "alternatives to media-blasting" you will see other ways mechanical methods for stripping parts. Just keep in mind that stripping powder coat, even with grinders is a tedious process and you will undoubtedly remove some metal in the process. As far as seeing swirl marks in the surface, this depends on the aggressiveness of the discs you are using and the powder itself. I would recommend doing some test pieces to figure out what method is acceptable to you and then go from there. I find that finishing the surface with 220 grit, either by hand or by machine sanding, is good for powder coating. I have used Jasco's stripper and it is probably the best stripper that is available locally, but it is not hugely effective on powder coating. It takes quite a few applications to strip powder coat and at ~$15 a quart, I find that it is not worth it. Understanding that you are a DIY'er and you probably don't want B17 in your garage, there is another option that I have used that I think is a lot more forgiving. It is still dangerous stuff but the fumes aren't nearly as bad. It is called Powder Strip PS-1L and it costs $160 for 5 gallons currently. 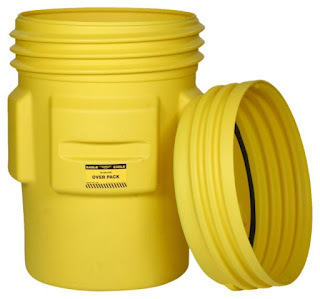 Sounds expensive, but I find that having a 5 gallon bucket of it is great for smaller parts. I keep it in a 5 gallon bucket with a screw on lid and it can last a year or so in a DIY setting. It doesn't strip as fast as Benco, but it works much better than anything I have bought off the shelf at local stores. Hope that helps. It would be difficult to strip a trailer that large with a liquid stripper. Dipping the trailer would be very expensive because of tank size and the amount of stipper you would need. Also, a trailer will probably have lots of crevices and pockets that you will not be able to sufficiently powder coat after stripping and rust would be an issue in these areas if they are bare metal. An alternative is using towels soaked in stripper and wrapping them or laying them on large surfaces and letting them sit. However, this his very dangerous as B17 burns skin on contact and its dangerous to breathe in. Unfortunately, I do not have personal experience with any of them but if you call Benco about this, I am sure they will be very helpful in answering questions. As with any powder coat strippers, make sure to be as careful as possible and wear all recommended personal protection equipment. Good luck! What sandblaster and size unit are you guys running also how much media do you go thru?